As of today we are just shy of 10 weeks before our scheduled departure date. When I think abut the end of May it seems far off, but when I think 10 weeks, that seems fairly close. We are about three-quarters of the way through GPS'ing the route (there will be a post completely related to the route). Getting everything prepared to live on the road is coming along. How our household will be managed during our absence is less settled. HVMP world headquarters operates out of a small room in our house. Luckily we took it over from our brother in-law and friend back in 2005 and said brother in-law lives right up the road. He has kindly agreed to handle shipping during our journey. Then there is the issue of our two felines, Micki who is sweet and Otto, who is a jerk. I need to get planning on their maintenance, luckily there are lots of family and friends nearby. While we are getting close to leaving on our trip, I'd like to believe this has been some years in the making. Steve (husband) has been riding for a long time, starting with dirt bikes as a kid. When we met we would ride 2 up on his Suzuki DR 650 from the Bronx up along the Hudson River. He (and an instructor) taught me to ride and I bought a used 1981 Kawasaki KZ440 at some point in the very late 1990's. Then things like our wedding and home ownership took up our time so we didn't ride much. We would go for local rides a few times a year, often riding two up on the KZ440. When we would hit bumps the back tire would scrape against the fender. Please refrain from the obvious comments about that, we know already. In 2004 Steve rode our friend's Honda VFR and something clicked. Not too long after that ride he owned his first street bike, a 2004 Kawasaki Concours, and the desire to travel via motorcycle began to grow. He recalled seeing the Concours at his local dealer the first year it came out in 1986 and he fell in love with it then. Luckily for him the Concours had not changed in the 18 years it took him to finally go buy one. 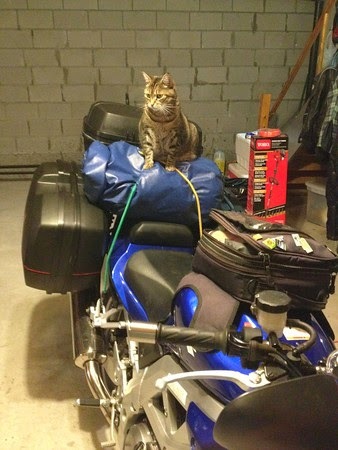 I tried riding on the back but it's not for me. So we bought my first touring bike, a used 2004 Buell Blast. With some soft bags and a kayak bag strapped to the back we were ready to go. Along the way I moved from the Blast to a Kawasaki Ninja 500, to a BMW R1150R, to a Suzuki SV650S, which is my current ride. My husband went from the Concours to the Buell Ulysses to a Kawasaki Versys 650 which is his current long trip bike. Our first week long trip (me on the Blast and Steve on the Concours) was in 2004 with two friends. We went without a plan other than stopping in Cooperstown, NY to see the baseball hall of fame. 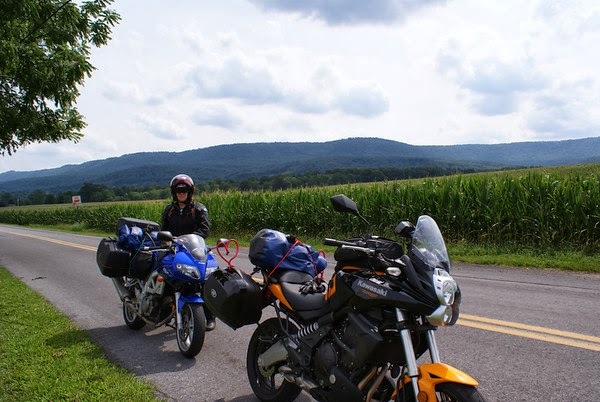 We wandered around NY, VT and NH for a week, riding around 1,500 miles, and we were hooked. It was on this first week long trip that we got to experience the kindness of strangers. One of our travel mates decided his bike was not running well and thought cleaning the carburetor in a gas station parking lot was necessary. I stayed out of it. I'm not useful there. Eight hours later the bike was still not running. A friendly gentleman came along and deduced the issue was probably yucked up spark plugs. He took the spark plugs back to his shop and blasted them clean with some sort of thing that blasts stuff clean and sure enough the bike started right up. He didn't have to take time out of his day to do that, but were all quite grateful that he did. By the time all this went down it was late and dark, so we went to the one hotel in town. We were just a few miles shy of the Canadian border but the restaurant/hotel we went to was nice enough to keep the kitchen open for us. The hotel was on a trucking route. When I requested a non-smoking room the reply I received was "Honey, I don't know what they do in them, but we have rooms if you want them." I could only respond by telling her we would take two rooms. Our two friends actually got the honeymoon suite since it was the only room in the place with two beds (?) as long as they were OK with dealing with the damage to the room which was inflicted by the recent wedding party? Since then we have tried to allocate a week long trip every year. Some of our destinations on our week long trips have included Nova Scotia, Fontana Dam in North Carolina, Marlinton in West Virginia, and Canaan Valley in West Virgina. 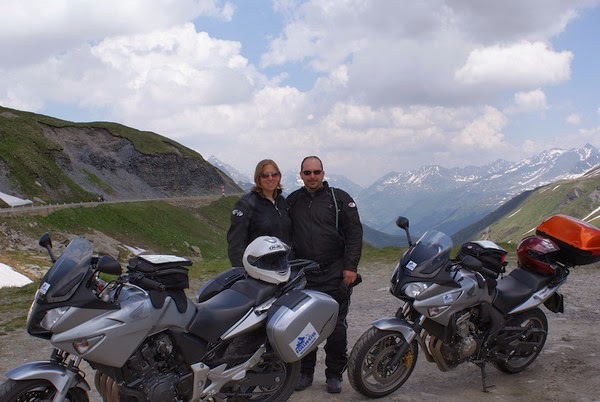 In 2008 we went on the Ultimate Alps Tour with Edelweiss. We hit Germany, Austria, Lichtenstein, Switzerland and Italy. We would definitely like to do something like that again. We had another kindness of strangers incident in PA. I'm not really sure where we were but we used to try to find dirt roads if they were available to us. We hit some mud and I performed what is known as a tank slapper (if you are unfamiliar with the term, just check youtube) and dropped my BMW R1150R. No real harm to the bike, but I broke off one of the bags. We were able to strap it on to the back seat. As soon as we finally made it off the dirt road Steve realized his wheel bearing on his Ulysses had given out. Road side assistance was being challenging, but then someone who worked for the local cable company came buy. Within 30 minutes he had some guys from a local repair shop out to pick up Steve's bike. They stopped everything they were doing and found some ATV bearings that fit the Ulysses. Within two hours we were back on the road. Total cost, around $50. Being from NY that could have charged us four times that and we would have been thrilled. The next morning as were trying to figure out how to reattach my bag so it wouldn't have to be strapped to the back seat for the whole trip a nice gentleman in the parking lot had everything we needed to wire it firmly into place for the rest of our journey. I will be tackling our month long endeavor on the Suzuki SV650S which we made some modifications to. Since it is the sportier model with the clip-on handlebars the sitting position was too leaned over for my liking. We did a handlebar conversion so it has the same handlebars as the standard SV. We also added the sidebags and a trunk. Steve's had side bags added to the Versys when he bought it and added a trunk as well. Given that our next trip will be four weeks in length and neither of us has never done anything like this before, there is no way we will feel really prepared but we hope we've at least had enough experience to appreciate when things go well and to manage when things go poorly. Please, can I go? I fit right here!